There are 10 Beads per Row and 4 Rows. The fifth and tenth Bead are colored Gold and called “5's Beads” because they parse the Rows into 2 groups of 5. Beads at the left side are counted, whereas Beads on the right are the supply. Each Bead in Row 1 has a value of 1. Each Bead in Row 2 has a value of 10. Each Bead in Row 3 has a value of 100 and each Bead in Row 4 has a value of 1000. When the count in a Row reaches 10 Beads, those 10 Beads are pushed back to the Supply Side and are traded for 1 Bead in the next higher Row. 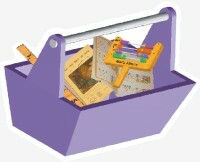 Care Instructions: Your Abacus Beads are designed to slide easily, yet stay in place when jiggled. This “grip’ is accomplished by special fingers molded into the Beads. 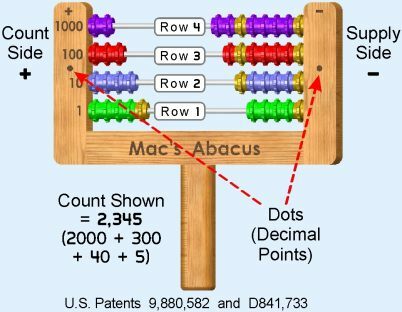 To assure long life of the Bead Grip Fingers, avoid putting Mac's Abacus in a Toy Box, where other items may press against the Beads. Also avoid placing objects on top of the Beads for any length of time. These types of actions could bend one of the Fingers, which may cause it to loosen its grip. Once the grip of a Bead is lost, it cannot be restored.